Muckdwellers are a race of very small reptilian humanoids. Though of intelligence comparable to the average human, their comparatively stumpy and clumsy forelimbs mean that they're unable to wield weapons or indeed construct anything more than simple, crude items which will inevitably come apart. Because of this, muckdwellers live on the outskirts of larger, more complex reptilian societies, such as lizardfolk and kuo toa. They essentially become glorified waste disposers and pest controllers. Because of a their small size (the largest ones are seldom longer than 2 feet), they are not a great physical threat to the most basic commoner. Indeed, the occasional missing small farm-beast or shiny object is the greatest harm that the ordinary muckdweller can do to a person without resorting to swarm tactics. Not much more to say about this creature, really. 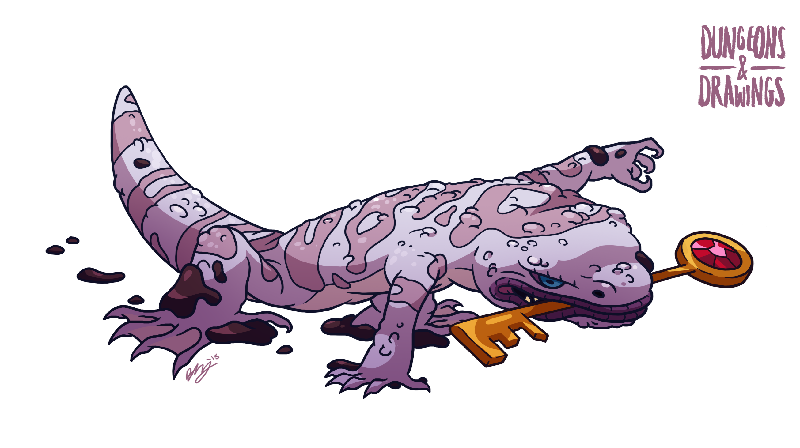 It's fairly basic, essentially a very weak Tiny sized lizardfolk. But the description of them said they looked a bit like Gila monsters, which led me to discover that they have bumpy skulls. Neato. Gelatinous cubes are a subset of oozes which share the remarkable tendency to settle comfortably into a cuboid shape at rest. While this might seem a uselessly bizarre trait, wizarding opinion speculates that the creatures may have thus evolved to comfortably exist in the man-made structures of abandoned underground structures such as crypts and dungeons. Here they simply "occupy" a cube of space, stretching wall to wall and waiting, spider-like, for prey to stumble upon them, whereupon they absorb and devour it. Of course, the particular danger inherent in gelatinous cubes is their near-transparency when not feeding. For new adventurers, a seemingly vacant corridor can quickly go from being a symbol of brief merciful respite ("oh, thank goodness there are no hobgoblins here!") to one of flesh-eating protoplasmic death ("it's eating our cleric!!!! And then it's going to eat me!!!! OH MY GOOOOOOD" etc etc). So, happy 300th post, everyone! We decided to go for something classically D&D-ish with this one, and as we're always pretty short on Oozes (an amorphous blob of goo is actually pretty hard to make into an interesting drawing, huh) I thought I'd go for one of the more famously silly variations on the creature type. 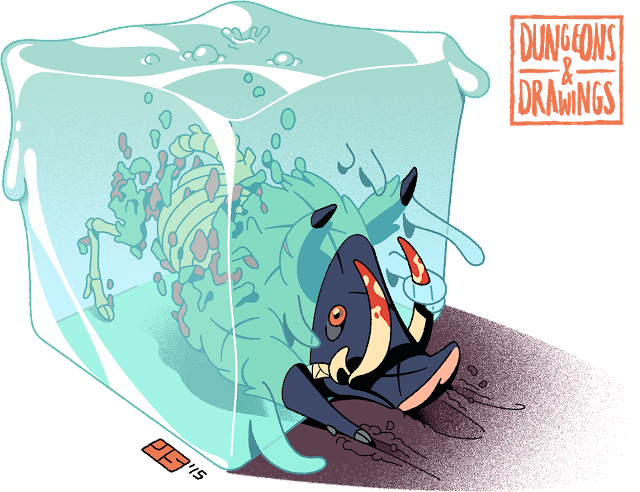 Gelatinous cubes have become pretty iconic among the fanbase (usually depicted with the traditional skull or somesuch floating within), confirming their awkward charm. I don't know the true origin of the creature but part of me suspects that the thing was an inspired by-product of trying to codify an ooze within a system with a grid-based ruleset. They make undeniably great corridor-filling deathtraps, but consider hanging one silently from a ceiling, then dropping it on your unsuspecting party! Also featured in this particular image is a hapless Razor Boar, which some among you may remember as Blanca's very first image for the blog way back in 2010. Drawing this I actually felt pretty sorry for the little fella. Getting eaten by an ooze is probably not a good way to go, as evinced by the 1988 remake of the classic horror/sci-fi B-movie The Blob (warning, very gory!) and, to a more comical extent, Death Bed: The Bed That Eats (superbly reviewed here by the guys over at Redlettermedia). Anyway, thanks to everyone who continues to follow us, we appreciate it. We're nearing completion on the second book now, it should be out in the later half of this year, so keep your eyes peeled for more news on that. Obviously thanks to Blanca, too - I feel a bit of a sham filling in for our 300th post when it's mostly Blanca's efforts that have kept the blog going over the years. Here's to 300 more!